There's going to be a new big bird Bimmer very soon. 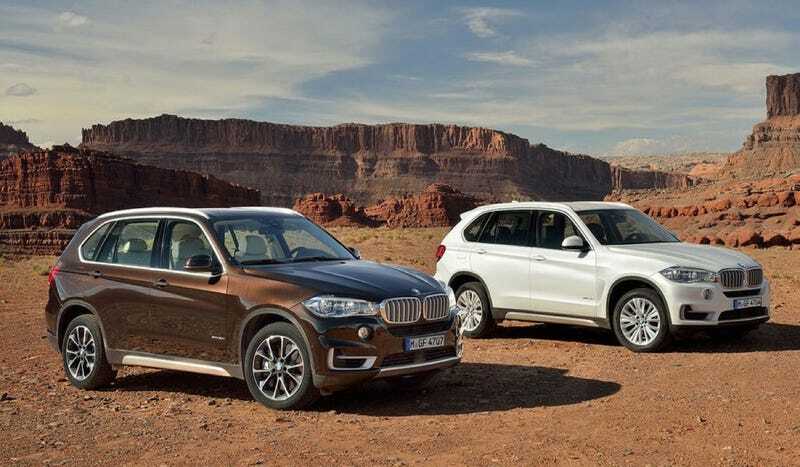 This is what the 2014 BMW X5 is going to look like. This shot was reportedly leaked by German car mag Auto Motor und Sport, and it looks like it's from the same photo set as the last leaked official pictures of the X5. Auto Motor und Sport also leaked those pictures back in January. The whole car will likely show itself at the Frankfurt Auto Show in September. Either this is some kind of elaborate ruse by ze Germans (never forget their trickery in starting the Franco-Prussian War! ), or Auto Motor und Sport has a mole deep within Munich, who is probably hiding in a vat of Weisswurst as we speak. CarScoops expects the X5 to cut 150 kilos (330 lbs) despite a longer wheelbase, and feature 2.0-liter turbocharged diesel and gas engines for Europe. They believe a straight six diesel is coming Stateside along with the usual gas I6s and V8s. What do you think? This, a Q7, or a Grand Cherokee?